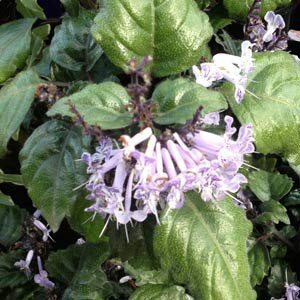 Mona Lavender is an interesting Plectranthus hybrid with attractive purple foliage and lavender coloured flowers. It does have a number of desirable characteristics that make it well worth consideration for a shaded position in the garden. Unlike many other Plectranthus species, Mona Lavender has a rather neat and compact growing habit, it is unlikely to spread and has a fairly upright habit. Bred in South Africa this shade loving plant works well in any position where it gets protection from direct sun in the heat of the day. It will grow in containers such as hanging baskets, but is equally at home in a fernery or a shaded border. Excellent as a ground cover plant when planted beneath ornamental trees. Foliage is a glossy green and flowers are indeed a lavender colour, rising on spikes above the foliage, flowers are small and tubular in shape but appear in masses. Will reach a height of around 80cm. In summer, many gardeners wonder about Mona Lavender not flowering. Be patient, this is a plant that flowers in late summer to autumn, and is well worth the wait. Mona Lavender is readily available for sale from Bunnings and Masters Stores as well as many retail nurseries. A humus rich moist but well drained soil and filtered to semi shade are the main requirements. Protection from frosts is essential. Mona Lavender can be trimmed or tip pruned to keep in shape and promote a more bushy growth habit.